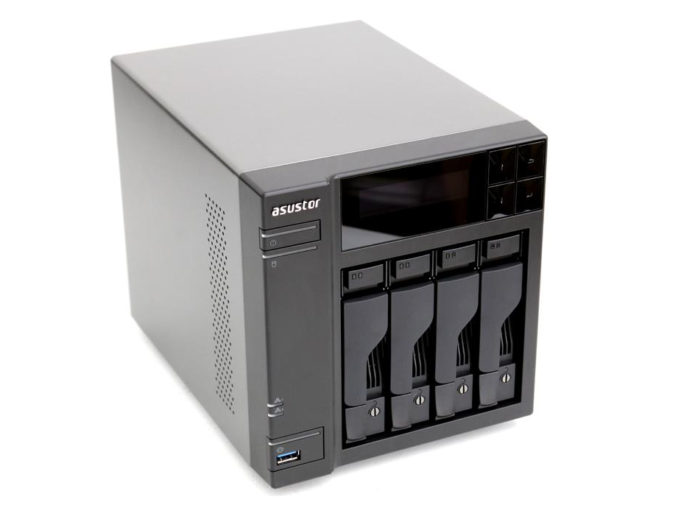 Asustor’s four-bay NAS impressed us last year and is still a contender nearly one year on, combining a powerful spec with some extremely versatile software. The move up from the two-bay AS6302T takes you from the dual-core Celeron J3355 to a quad-core J3455, while RAM leaps from 2GB to 8GB. This gives you scope to run a more demanding set of apps, including virtual servers through VirtualBox and a full Linux desktop with Asus’s Linux Center app. Connect a display to the HDMI port, and a mouse and keyboard via USB, and your NAS can moonlight as a working PC. Moving up the Asustor lineup also nets you a two-line LCD status display along with four navigation buttons, enabling you to check and configure the network connectivity, change server names, initialise, shut down and restart the NAS, without firing up the browser-based control panel. Otherwise, the AS6404T has the same physical strengths as its baby brother: rock-solid build quality and excellent connectivity, complete with a USB-C port. Having to screw the hard drives into their slide-and-lock caddies is fiddly, but it’s a minor inconvenience in the grand scheme of things. Asustor could do a little work on the initial setup. You can set up Synology or Qnap’s units purely through a browser, without downloading a specific configuration tool. Plus, we had issues getting Asus’ preferred Universal Media Server app up and running, and the media folders accessible, until we reconfigured the network connection, by pure coincidence, to use Link Aggregation. Beyond that, the ADM OS works smoothly, delivering a platform for a huge range of apps, covering cloud-sync backup through Google Drive, OneDrive and Dropbox, media playback through Plex and Twonky and even business apps through LibreOffice, SugarCRM and WorldCard. The AS6404T can also still function as a powerful, 4K-capable media player via the Asus Portal app, running Kodi or streaming video from Amazon Prime. In terms of file-transfer performance, the four-bay Asus sits somewhere in the middle, beneath speed demons such as the Buffalo TeraStation and Netgear ReadyNAS but well clear of the slower units. The only sticking point is the price. Given what the Asus offers it’s still good value, but the Synology DS918+ and Thecus N4810 offer similar features for less.